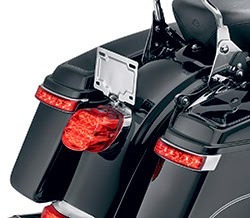 Command more attention from following vehicles with the new Electra Glo™ LED Saddlebag Run/Brake/Turn Lamp (Red or Smoke Lens, $209.95) for 2014 Harley-Davidson® Touring motorcycles from Harley-Davidson® Genuine Motor Parts and Accessories. These running, directional and brake lights feature bright, fast-acting LED lamps that glow red when the ignition is on, and intensify when the turn signals or brakes are activated. The lamps act as a supplement to the Tour-Pak®-mounted rear lighting, and also permit the removal of the Tour-Pak with a Detachable Mounting Kit. The lamps are housed in a low-profile self-adhesive chrome frame that hugs the curve of the hard saddlebags. This complete kit includes left and right lamps, modulator, and quick-disconnect wiring harness and is available with red or smoked lenses to fit all 2014 Touring models with hard saddlebags. See an authorized Harley-Davidson dealer for fitment details.